In Greek mythology, Paris was a handsome young prince who eloped with the most beautiful woman in the world and caused the Trojan War*. The son of King Priam and Queen Hecuba of Troy*, Paris seemed destined for disaster from birth. Shortly before he was born, his mother dreamed that she gave birth to a flaming torch that destroyed Troy. Priam consulted a seer, who warned the king that the dream foretold disaster for the city. He advised Priam to have the baby killed. When Paris was born, Priam ordered a shepherd named Agelaus to take the infant and abandon him on Mount Ida. Agelaus followed the instructions, but when he returned to the mountain after several days, he found the infant still alive. Moved by pity, the shepherd took the baby home and raised him as his own son. Paris grew into a very handsome young man. In time he married Oenone, a mountain nymph, and lived with her in the mountains, where he tended cattle. Paris, a young Trojan prince, had to choose which goddess—Hera, Aphrodite, or Athena—was most beautiful. 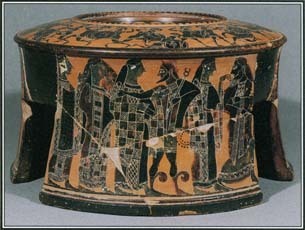 His decision, known as the judgment of Paris, is depicted on a vase from the 500s B . C .
One day Priam sent servants to the mountains to fetch a bull as a prize for a festival. When the men chose Paris's favorite bull, Paris decided to go to Troy, enter the festival contests, and win the animal back. The young man won all the events, defeating Priam's other sons. Agelaus revealed Paris's true identity to Priam and, forgetting the prophecy , Priam welcomed Paris and restored him to his rightful place in the royal household. Some time later, Zeus* chose Paris to decide which of three goddesses was the most beautiful. Eris, the goddess of strife or discord, had tossed a golden apple inscribed with the phrase "For the Fairest" into the midst of the guests at a wedding. Hera*, Aphrodite*, and Athena* all claimed the prize. Each goddess promised Paris a special gift if he decided in her favor. Hera promised to make him a powerful ruler. Athena promised him wisdom and victory in battle. Aphrodite offered Paris the love of the most beautiful woman in the world, Helen of Sparta. Paris awarded the golden apple to Aphrodite. His decision, known as "the judgment of Paris," enraged Hera and Athena, who began to plan their revenge. In the war that followed, Paris played only a minor role. As a warrior, Paris was greatly inferior to his brother Hector*, and his cowardly nature won little respect. At one point, Hector forced Paris to fight a single-handed combat with Menelaus after the Trojans and Greeks agreed that this would end the war. When Menelaus came close to winning, Aphrodite stepped in and rescued Paris, and the war continued. Paris later killed the Greek hero Achilles* by shooting an arrow into his heel, the only spot where Achilles could be wounded. Then Paris himself was struck by a poisoned arrow. He was carried off the battlefield and taken to his wife, Oenone, who had the gift of healing. Angry that Paris had abandoned her, Oenone refused to help him. When she relented shortly afterward, it was too late. Paris was dead. See also Achilles ; Aphrodite ; Hector ; Hecuba ; Helen Of Troy ; Iliad, The ; Menelaus ; Priam ; Trojan War ; Zeus .